Join us on Thursday, November 9th, when we head to LIVE! at The Battery, one of Atlanta’s coolest and newest venues, located next door to the new Braves stadium (including free bar games, a huge patio, and beautiful spacious area just for us)! This venue will be the perfect backdrop to help you make new friends and business contacts, as well as to go deeper with the familiar faces you’ve met at our previous events! Meet some of Atlanta’s best Under 40s in a comfortable and fun environment to make new friends and business contacts! Enjoy complimentary light appetizers while you kickstart new relationships! Free parking for up to 4 hours! Free bar games like skeeball to keep things fun! We will be capping ticket sales for this event at 400 to be sure everyone has a comfortable experience. We’ve sold out before, so get your tickets early while they’re available! We also encourage you to consider taking Uber/Lyft/Taxi for safety if you plan to drink at our event. As noted above, there’s a special promo code for first-time Lyft users. Parking Information: In the RED Parking Garage where you can receive 4 hours of complimentary parking, park as closely to the third floor as possible as it is ground level with Live! at the Battery. Once you walk out of the Garage, make a right as if you are walking towards the stadium. You will see a large water fountain on your left hand side. Live!at the Battery is located just past the fountain, directly in front of the Right Field Gate entrance to SunTrust Park. Or you can skip the parking and arrive safely with a special promo code for first-time Lyft users: NU40 (Up to $20). Many thanks to this month’s sponsors First Option Mortgage and KoutureBooth as well as this month’s featured nonprofit Bwanali Chipole Victory, Inc . We look forward to you meeting them! Grand Prize Winner will receive a complimentary Chef’s dinner for four in Todd English Tavern. Reservations are to be made through LBerger@liveatthebatteryatlanta.com. Restrictions Apply: Guests must be 21+. Reservation must be on a non game day / non Battery event date. Cannot be combined with additional coupons or other offers. Second Prize Winner will receive a $100.00 Gift Card to Live! at the Battery. No expiration. 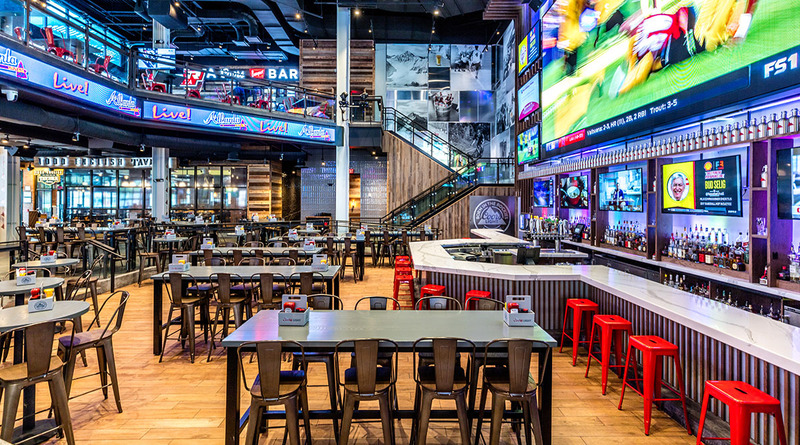 Gift Card may be redeemed at Todd English Tavern, Sports and Social, or PBR Atlanta.